The Best Preview Render button will create a high-quality render of your model. If the floor is showing and the Shadows option turned on then shadows will be rendered onto the floor. To save an image file from your render, press the Export button in the Document palette when the BPR render has finished. 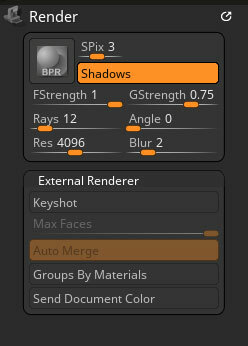 The Global shadow Strength slider allows you to adjust the amount of shadow being applied to your entire model. A higher value gives a stronger shadow. The Res slider will set the shadow resolution in pixels: This figure is effectively the image size (independent of document size) that ZBrushCore uses internally to calculate the shadows. Lower settings will render more quickly, higher settings will give greater accuracy. Sometimes a lower value can give the desired result with less processing overhead – for example, when soft shadows are required. ZBrushCore will work with KeyShot if you have a suitable version of KeyShot installed, and the ZBrush to KeyShot Bridge. KeyShot enables the Bridge between ZBrushCore and KeyShot. When enabled, any time you tell ZBrushCore to do a BPR render it will automatically send your model to KeyShot. If disabled, ZBrushCore will use its own BPR renderer. Because ZBrushCore can send large amounts of data to KeyShot, the information usually needs to be split into smaller chunks to speed up the Bridge process. (See the Max Faces section above.) The Auto Merge mode then tells KeyShot to weld all these parts to rebuild the models as they originally were in ZBrushCore . The Group by Material mode creates a separate group for each ZBrushCore material applied to the model’s SubTools. This means that hav­ing multiple materials applied to your model in ZBrushCore will produce the same number of material groups in KeyShot. These groups are simply defined by the materials in ZBrushCore ; no other visual representation exist. When enabled, the Send Document Color mode instructs KeyShot to set its own document background color to match your ZBrushCore document background.